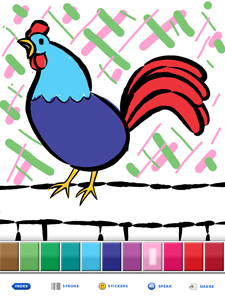 Tipitap Apps just released their Color & Draw app for the iPad. Now, there is lots more room to work. Even I managed to color a page! Real finger painting. Not the classic "the-machine-fills-it-for-you" app engine! Kids develop and improve their fine motor skills and creativity. Limited curated color palette. Enough colors choices for a full spectrum of artistic expression yet restricted so kids are not overwhelmed by too many options. See my original review for more info.